Do you bite or do you twist and lick? Either way two of the nations favourite treats have been fused together to create the Reese’s Peanut Butter Oreo, and they are a must try! It is no secret in our house that I am a fully fledged peanut butter addict, and will buy pretty much anything that has PB in it for that very factor. Oreos are all the craze in America and the number of flavours are quite frankly insane. Double stuff, Golden, Red Velvet, Fudge covered, Strawberry Milkshake, Cookie Dough and even 100kcal Oreos; you name it they do it. In fact how people go into a supermarket and pick one flavour is beyond me. Here in the UK we are seemingly slow on the uptake and the more exclusive flavours you can only get online or in specialist American sweet shops. These little minis are from The State Side Candy Co, in fact I have never seen mini ones in anything other than original, and at £1.75 (special offer) they were a bargain. The taste test …. They are cute and dinky as you imagine, albeit there were quite a few that had come apart but they were equally proportioned. The filling sticks to the traditional Oreo creme filling and not like a reese’s peanut butter cup. I am not a huge fan of Reese’s peanut butter as a stand alone, but the slightly saltiness of the peanut butter works perfectly with the dark chocolate biscuit, enhancing it’s flavour and making a seamlessly simple sweet treat even better. Even the Chief of the household who is certainly not partial to anything with peanut-butter on or in, was pleasantly surprised and happily munched on the rest of the bag. I personally would have loved more PB filling, but then my attitude is when you bite into something the peanut butter should stick to the roof of your mouth!! Really the only problem you will find with these is trying to not eat the whole bag in one go! Prepare to become addicted! What is your favourite Oreo? 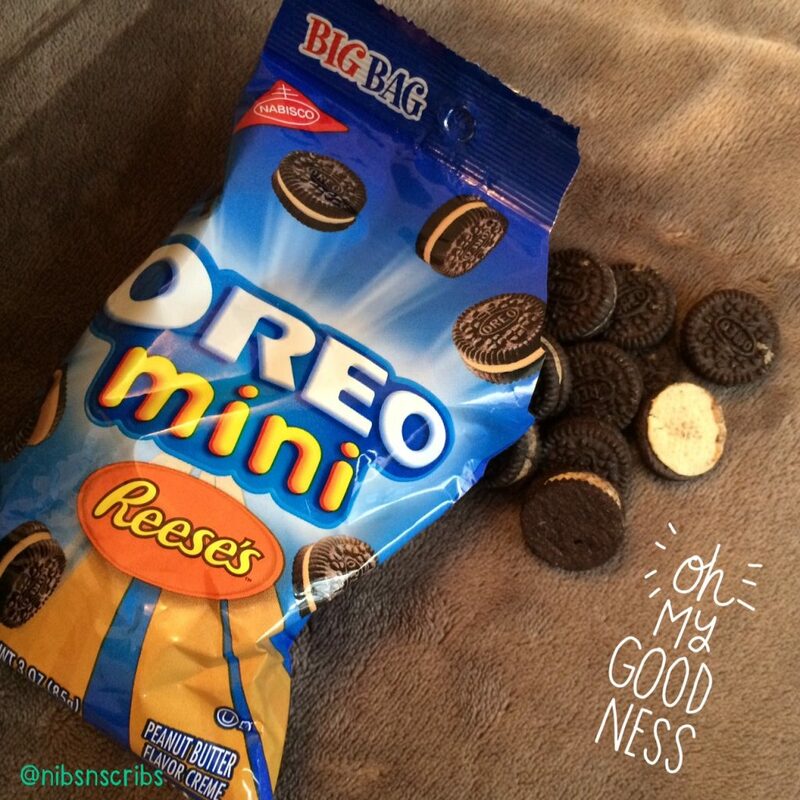 We would love for you to let us know your thoughts, feelings and opinions on all things Oreo and Peanut Butter.